Using Global Industrial Floor Cleaners as part of your facility's floor care program provides a polished appearance at a great value. 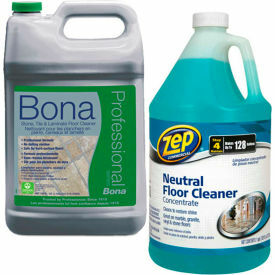 Concentrated cleaning and stripping formulas save costs, freight and storage space. Achieve long-lasting, mark resistant glossy floors with the convenient floor cleaning kit. 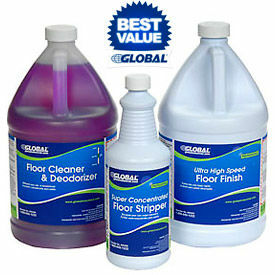 Floor cleaner & deodorizer can be used on other surfaces such as walls and woodwork. Professional grade Floor Cleaners can enhance a facility's overall ambience for guests, clients and employees. Removes tough dirt, road grime and scuff marks from high traffic flooring. 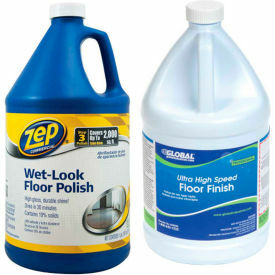 Can be used on wood, marble, granite, vinyl, ceramic, porcelain, concrete, terrazzo, stone or other hard surface floors. Concentrated and ready-to-use formulas available. Floor Finish beautifies and protect floors with a glossy and scuff resistant coating. Designed for use with high speed buffing and burnishing machines. Use on resilient tile, terrazzo, and other floors that are frequently buffed and burnished. Meets or exceeds ASTM D-2047 standards for slip resistance. 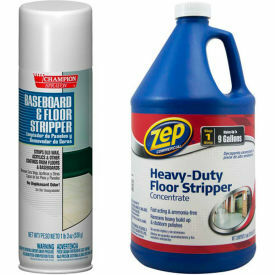 Floor Strippers emulsifies floor finish and sealer for quick and easy removal. Removes multiple layers of finishes and dirt buildup as the first step in floor restoration. Baseboard strippers are sprayed vertically for removing finish from baseboards and molding.